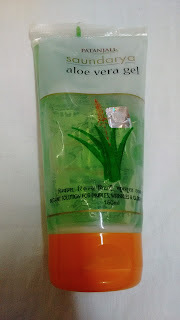 Aloe vera gel for hair care & skin care does it really work? The answer is yes. My current go to product for glowing skin care and hair care is aloe vera gel from Indian brand Patanjali Ayurved. They have some amazing products to try on. It is an affordable brand, one can shop online. The product carries less chemical and natural ingredients are present. It contains Vitamin E, aloe vera gel, permitted color. Application: it gives cold soothing sensation. Face mask : Take sufficient quantity of aloe vera gel and apply it on the face. Gently massage your face, leave it on for 15 minutes, later on rinse face with cold water and pat dry. It give a fresh, moist look to the skin. Night Mask: Take sufficient quantity of aloe vera gel and apply thin layer on the face. Leave it on for the night and rinse face in the morning with cold water. It will help remove dark spots, acne scars,wrinkles on regular use. Hair mask: Take sufficient quantity of aloe vera gel and apply it on the scalp. Leave it on for 20 minutes. Post which wash hair with water, gentle mild shampoo. It will solve your hair loss, dandruff problems. The product is amazingly good for everyday use. If you have blemish prone skin, dry skin, acne scars, wrinkles, dark spots, dandruff problem use it daily for effective result.